Blessings in life seem to occur spontaneously at opportune moments in time. When received, they lighten our load, make our eyes sparkle, tickle our fancy, and bring spontaneous joy to our hearts. Blessings, happenstances, coincidences, synchronicities and grace all find us at certain spots in our lives, but if we pay attention these affirmative mental taps should not leave us where they found us. Thought habits create the connecting links to the favorable circumstances that occur in seemingly miraculous ways. In our environment, plans are carried out in perfectly natural ways according to the laws of cosmic habitforce. Dr. Hill states that there are no inexplicable miracles in this universe, just natural outcomes of the building blocks of time, space, energy, matter and intelligence that nature uses as She creates all things. When occurrences appear miraculous, Nature is at work creating and manifesting something that we as humans do not yet fully understand. This is Infinite Intelligence utilizing cosmic habitforce to make things happen that at this point in time may appear miraculous. In his book, You Can Work Your Own Miracles, Napoleon Hill discusses this process in depth. He believes that miracles are natural occurrences that we do not yet fully comprehend given our current knowledge. That is why you can begin to learn the process of creating miraculous outcomes by studying the process that occurs via cosmic habitforce. 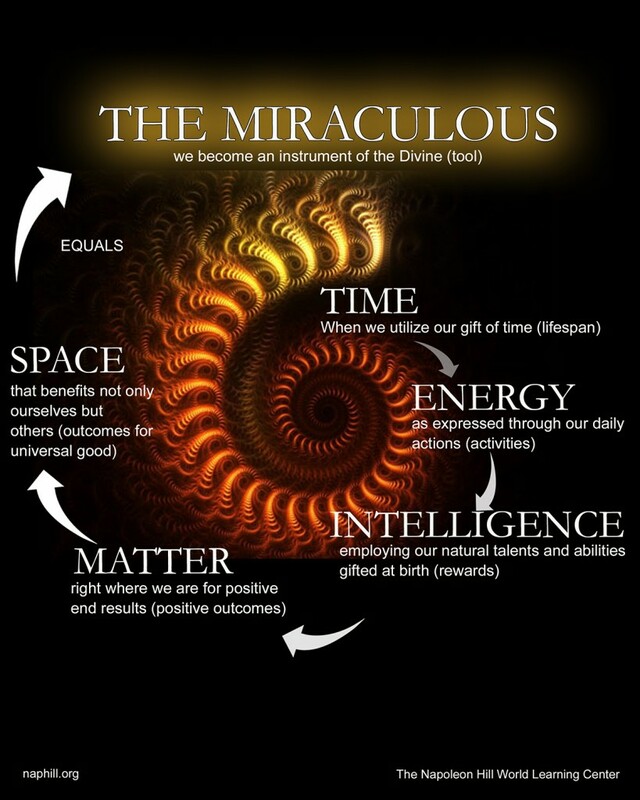 By using the gifts that we are given at birth, our time (lifespan), the space we occupy (physical location), our physical characteristics (personality + body) and natural intelligence (IQ + Spirit), we are the microcosm (body+mind+spirit) that can emulate the macrocosm (Infinite Intelligence manifested in Cosmic Habitforce) in order to achieve our picture perfect end result. Miraculous: we become an instrument of the Divine (tool) in much the same way that an acorn grows into a giant oak, a pine nut soars to become the tallest of pine trees, and seeds of wheat grow to feed entire populations. Our seeds of talent can do the same amazing things if we plant, nurture, and harvest them properly according to the laws of cosmic habitforce. By applying the principles, you will reap your best intended harvest because happen it must both for your good and the good of others. How does cosmic habitforce convert a positive emotion or desire created in the mind of man into its physical equivalent? It intensifies that emotion or desire until it induces the state of mind known as faith. In this state the mind becomes receptive to the inflow of Infinite Intelligence from whence are derived perfect plans to be followed by the individual for the attainment of his desired objective. These plans are always carried out by natural means. Cosmic habitforce does not directly transmute desires for money into the coin of the realm, but it does activate the imagination to reveal to the individual a way to make the conversion through accepted procedure. This force works no miracles, makes no attempt to create something out of nothing. It helps, or rather — compels, the creator of a strong desire to carry his thoughts to completion through all possible and available natural media. Often a person is awed by what appears to be coincidental combinations of favorable circumstances as he carries out his plans, but these strange and unexplained things happen in a perfectly natural way. Cosmic habitforce impacts a peculiar quality to your thought habits which gives you power to surmount all difficulties, remove all obstacles, overcome all resistances. Just what this power is, is a secret as profound as the secret which causes a seed of wheat to germinate, grow and reproduce itself, handing back to the farmer a hundredfold measure for his intelligent effort. You do not need to know how it works to follow the simple rules given to you for utilizing it in your affairs of life. Source: PMA Science of Success. Educational Edition. TheNapoleon Hill Foundation. 1961. Pgs. 492-493.